Obra del Artista Carlos Terrés Escultor y Pintor Mexicano, realizada en 1981. – Escultura (35.00 x 19.00 mts.) “Alegoría del mestizaje” en terroca y concreto armado, para la Ciudad de Chetumal Q. Roo. 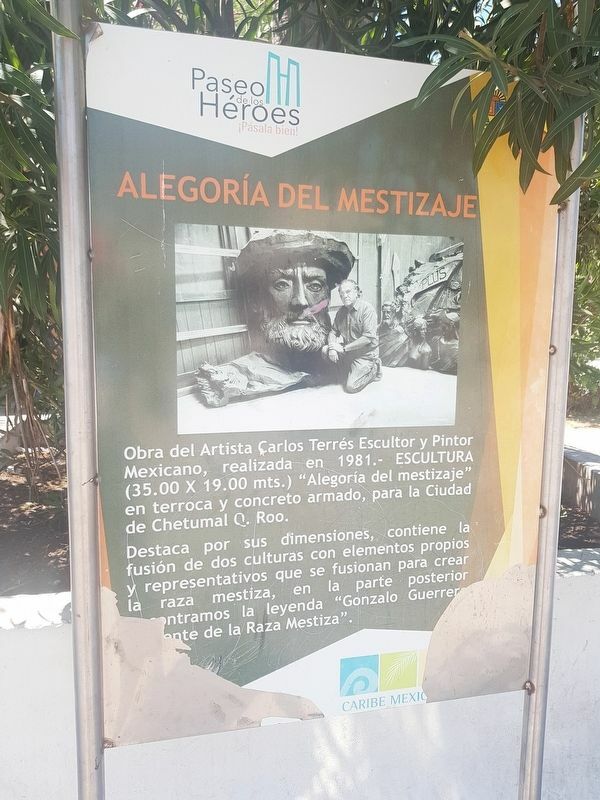 Destaca por sus dimensiones, contiene la fusión de dos culturas con elementos propios y representativos que se fusionan para crear la raza mestiza, en la parte posterior encontramos la leyenda “Gonzalo Guerrero – Pariente de la Raza Mestiza”. This sculpture is the work of the artist Carlos Terrés, Mexican sculptor and painter, and was made in 1981. 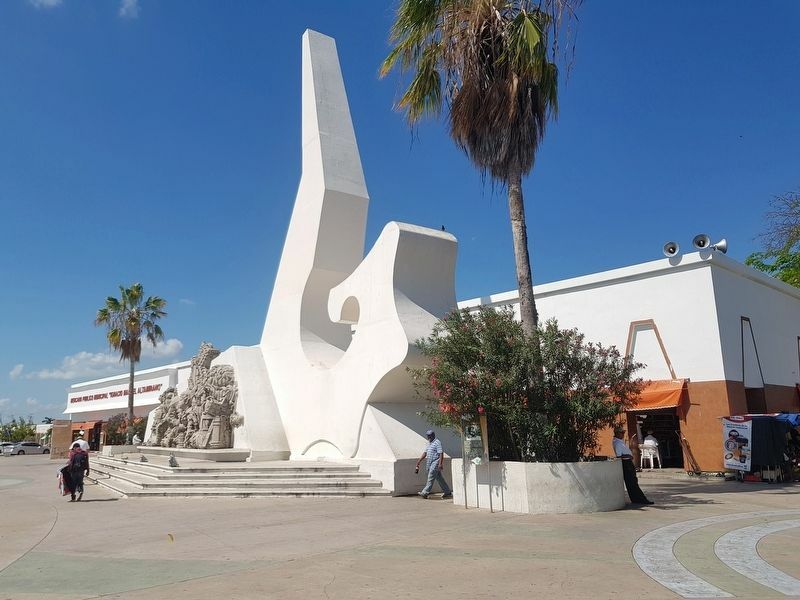 The sculpture, measuring 35 x 19 meters, is named the "Allegory of Mestizaje" and was made of clay and reinforced concrete for the city of Chetumal, Quintana Roo. It is notable for its dimensions. It contains a theme on the fusion of two cultures, with its own representative elements that symbolize the creation of the mestizo race. On the monument’s reverse we find the legend "Gónzalo Guerrero - Pariente de la Raza Mestiza". The marker can be seen to the right of the sculpture, partially obscured by bushes. Location. 18° 30.208′ N, 88° 17.732′ W. Marker is in Chetumal, Quintana Roo, in Municipality of Othón P. Blanco. Marker is at the intersection of Avenida de los Héroes and Mahatma Gandhi, on the right when traveling south on Avenida de los Héroes. Touch for map. Marker is in this post office area: Chetumal, Quintana Roo 77000, Mexico. Touch for directions. Other nearby markers. At least 8 other markers are within walking distance of this marker. Manuel Ignacio Altamirano Market (within shouting distance of this marker); The History of Chetumal: 1960-1970 and 1970-1980 (about 90 meters away, measured in a direct line); The History of Chetumal: 1940-1950 (about 150 meters away); Avenida 5 de Mayo (about 180 meters away); Vice Admiral Othón Pompeyo Blanco Núñez de Cáceres (about 210 meters away); Belisario Domínguez (about 210 meters away); La Calle del Relox (approx. 0.3 kilometers away); The Morelos Maternal and Children's Hospital (approx. 0.3 kilometers away). Touch for a list and map of all markers in Chetumal. Regarding Allegory of Mestizaje. "Mestizaje" is a hard word to translate from Spanish, but it encompasses the mixture and combination of indigenous and Spanish cultures that has created a large part of the richness that is Latin America today. 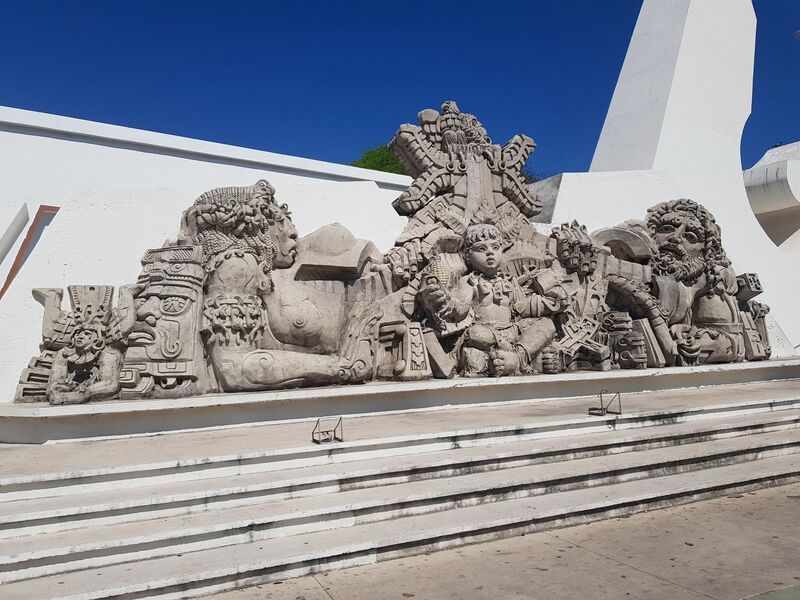 The sculpture includes a representation of indigenous cultures on the left and Spanish on the right. More. Search the internet for Allegory of Mestizaje. Credits. This page was last revised on March 31, 2019. This page originally submitted on March 31, 2019, by J. Makali Bruton of Querétaro, Mexico. This page has been viewed 35 times since then. Photos: 1, 2, 3. submitted on March 31, 2019, by J. Makali Bruton of Querétaro, Mexico.